Wiley CPA Books (officially known as Wiley CPAexcel Exam Review) is a collection of study tools offered by this top text book publisher. It is the #1 seller of review materials in CPA exam preparation for many years. What is Wiley offering and why is it such a hot seller? More importantly, is it suitable for your needs? If you are a first-time candidate, you will find the first 4 chapters of the book pretty useful. It introduces the basics of the CPA exam including how gradings are done, the computerized format of the test, and what to do/not do at the exam site. Chapter 5 is the main section of the book with the study materials, multiple choice questions and simulations. Then, there are 3 appendices with a FAR sample exam as well as some released questions from AICPA. Considering the need to squeeze everything on financial accounting in one book, I think the Wiley CPA book are organized and well written. Using the FAR book as an example, the content is divided into 14 modules covering concepts and standards for financial statements, identification and calculation of various items in the statements and transactions, accounting and reporting for governmental entities and not-for-profit organizations. Each module is around 30-50 pages of study materials with with lots of multiple choice questions and simulations for you to practice. Since the CPA exam covers a huge number of topics but never goes too deep in any subject, the Wiley CPA books serve this purpose well. It does not give a lot of background information on the accounting concepts because the authors assume that you know the material. It is a hard-core, no-nonsense book — It covers just enough materials to get you pass. With Wiley alone you probably won’t score 99 and be able to show off your Watts Sells Award… but for me, who cares. I pass the CPA exam and that’s enough for me. The CPA exam fee costs a fortune and you want to save every penny. Totally understandable. If you don’t need a real person to talk to you or video instruction to go through the concepts again, this set of Wiley CPA books is the best deal. For example, the book is retailed at $260 and together with the Test Bank (which you MUST get) for $127 per parts, the whole package is selling at $768. Better yet, you can often get a good discount, as shown below. When compared to most other CPA review courses which sell at $2,000+ these days, The Wiley book and test bank combo is costing less than 1/2 of the price. When compared to Becker at $3,393… it’s a steal! Many live classes across US universities use Wiley’s books and test bank to complement their lectures. The instructors spend a lot of time going through Wiley’s MC questions as a way to clarify the accounting concepts. This shows that Wiley’s book + test prep software is the best in trade. I guess the flip side of being very comprehensive is that it can be overwhelming — While Wiley seems to be addressing this long-time issue with more bullet-points, the FAR book is still, again, a huge, scary, 1,000+ page of condensed text. I guess as a textbook it is doing as best as they can, but I can see that some students would prefer the materials delivered in, say, video format with some interaction discussion on the practice problems. Since you could be purchasing the book online without physically flipping through the book, I’d like to bring this to your attention. All books in this Wiley series are printed on newspaper print, which may not sound like a big deal but is surprisingly a common compliant from my readers. This may not apply to everyone, but for those who need a lot of hand-holding on learning / relearning the concepts, a guided review, be it a live class or online self-study, is usually a more integrated and thus better approach. This is not a criticism to the Wiley CPA books but an acknowledgement on its limitation, considering the Wiley’s significant price discount. If you are a qualified CA or CPA from another country, an accounting major, or an accountant or auditor, I don’t think you need to worry about this — you are likely ok with Wiley CPA Books + Test Bank. Thanks… But Should I Get the Books or Not? If you have forgotten all your accounting or you have never taken an accounting class, I suggest that you pick a comprehensive CPA review course on this list here. If you are relatively familiar with accounting, capable of intensive self-study for at least several months, and don’t mind reading pages and pages of small texts, then this set of Wiley CPA books is the logical choice. Many candidates pass the exam with these books alone. These notes are essentially the summary of the Wiley CPA Review Books. They cannot be used as a replacement of the text books, but it is a good tool for your review or as supplement to other review courses. The Test Bank, with thousands of practice questions in computerized format, is an integral part of your CPA exam preparation. In my opinion this is the best among the Wiley’s products and you can get a detail pros and cons analysis here, plus a discount of $92! Thanks for your great review. I am just wondering if i need both the book and the software or either one would be enough? Thanks for checking my brand name page! Are you relying only on Wiley to study for the exam, or use Wiley as supplement? If supplement, software CD is good enough; but if this is your core review material it’s better to get both because the CD is simply practice tests. This is a good point – I will think of a way to explain it above. Thanks! I m planning to rely only on Wiley CPA Excel Review and test bank . I am a Chartered Accountant from India. Currently I’m only using the study material for studying FAR( 02/20/2016) ..I have just completed reading 1 module from the book and planning to give exam in May( 02/02/2016)..So I have 2.5 months more to study FAR..Do u think any other supplementary material is necessary for me to refer..If yes..I would like to know which video lectures should I refer in addition with Wiley notes. This is my first time I am appearing for exam..I am staying in US on h4 visa. So time is not my constraint. I am lil bit confused whether am I going on right tract as there is no study buddy or no friend to discuss with. Hi Ankita, in my opinion it’s worth getting also the Wiley test bank (the online test prep). You shouldn’t need other supplementary unless you don’t feel comfortable after working on the test bank. My site sells them here (see link below) but you can also get them from Wiley directly. It’s the same product. I am refering for FAR wiley book of july 2015 edition and my exam is on 5th may 2016. So i want to know whether i should refer anything additional for updates on FAR for 2016 .. Thanks for your immediate reply..I was a bit confused before but now you have cleared my doubts.. I am planning to give exam in January 2017. I have a question which year book should I buy? Right now I am using 2015 beckers professionals . Also do you have any idea in which month latest version of cpa book is published .So that I can wait to buy the new edition books. In terms of the 2016 changes, change is relatively minor. You may want to check out this page and see if you need an updated version. In my opinion, you may want to consider getting a new set of practice questions (instead of the full set) given the few changes. As you said some exams may be taken up in the later half of the year 2017. Can you suggest which book set should I buy? Some tax code may have changed in particular. I would get the latest book, but definitely at least get the latest test bank to make sure I don’t miss anything. Thanks a lot Stephanie for the advice; Will keep in mind the points while preparing for the exams. I am planning to do Pursue CPA, and i want to do basically self study. Please suggest me what all materials I should use for self study? And from where i can get comprehensive study material for CPA. And one more thing whether one can clear CPA through self study or its mandatory to take classes. what is the difference in the January and the July books? I don’t want to purchase the January books if the July books are going to have changes please help. Can I take the exam any time I want? 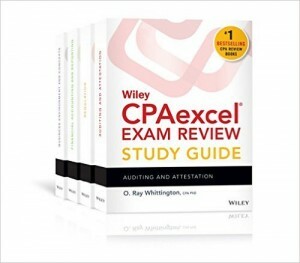 I’m have 2011 books of wiley cpa exam review (far, aud, bec, reg) which i am using as a supplement for my RPCPA and at the same time CMA review. is there a big changes compared with the latest 2016 edition? Hi Juliet, we are talking about 5 years — quite a lot of changes I have to say. You can find out the details on my 2014/2015/2016 CPA exam change pages: https://ipassthecpaexam.com/2017-new-cpa-exam/ (there are links right below the image). So I wouldn’t use it for CPA exam preparation, but if it is only used as a supplement to other exams, as background knowledge in general accounting, it should be ok because it’s not like the accounting rules have changed, it’s the emphasis that have been changed. Hi Stephanie, first of all, great website! I plan to take the CPA Exam by mid 2017. Do you suggest using the July 2016 edition or wait for the January 2017 edition? Hi Renne, if you have online courses, it doesn’t matter as the system updates itself and you always get the most up to date version. As for the books… I would probably wait till Jan 2017 to get the latest version. Hi Stephanie, I am a Chartered Accountant from India and plan to take CPA exams in Jan 2017 and April 2017 (2 papers each). Please suggest what course to take? Will only the books be enough or do i need to buy the Platinum course? Any changes from Jan to April will be available through the books or its better to take Platinum course which will update automatically? Also, do i need to buy test banks separately, if i am taking Wiley CPA books? Hi Rahul, if you get the platinum course, they have everything include two sets of test banks (from both CPAexcel and Wiley). If it is the books, you don’t have all the online features but I guess some candidates do pass with the books alone. It’s hard for anyone to tell. If you are to get the books only, please also get the test bank because otherwise you don’t get to practice answering questions online and it will be quite risky in my opinion. There shouldn’t be changes for the 1st testing window in 2017. Good luck! Hi Stephanie! Your website is extremely useful and I really love that! Keep up with the good work! I am thinking of taking the REG part in Q1 of 2017, is it okay for me to use the 2016 January edition of Wiley Review Guide for revision? Thank you very much! You may notice that Wiley is holding off publishing the new edition which is normally released in December. I failed Reg twice, am using Wiley to study and had used Kaplan before. Any advice.